Many adults or older teens would like to improve their smiles but hate the idea of traditional orthodontia. 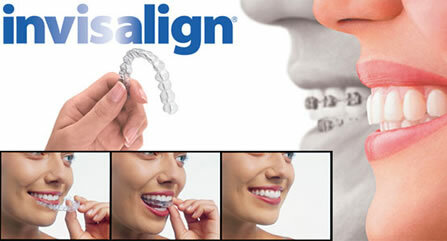 Invisalign is an orthodontic treatment that is a great alternative to metal braces. Unlike traditional braces, patients don't have to endure painful, ugly metal wires or bands. Virtually invisible, the Invisalign system works through a series of custom aligners. During the first step, the dentist will take impressions of your teeth and digitized them. From these impressions, your doctor can create and manipulate a computerized image of the teeth. Using the 3-D model, the dentist will plan out the movement of the teeth. Custom aligners are then generated to fit your specific case. Every couple of weeks, patients change the aligners as prescribed by the dentist. The aligners gradually reposition the teeth little by little until you can enjoy a straight, attractive smile. With Invisalign, adults who want to maintain their mature images don't have to deal with the embarrassment of metal braces. Another obvious advantage of Invisalign is that the aligners are removable, so patients can take them out to eat, brush, and floss. Will Invisalign aligners straighten my child's teeth? Because they still have baby teeth that need room to come out, dentists don't recommend Invisalign for young children. As well, most kids don't have the discipline needed to wear, care for, and keep up with the Invisalign aligners. Although the actual length of time depends on the individual case, usually Invisalign will straighten your smile in 6 to 18 months, often less time than with traditional orthodontic therapy. Your dentist will see you every four to six weeks to monitor your progress. Since the aligners are removable, can I take them out whenever I want? Most patients love the fact that they can take their aligners out for eating, brushing, or on special occasions. For optimal results, you need to wear the aligners about 22 hours a day on a consistent basis.